The biceps tendon (a strong, cord-like structure) connects the biceps muscle to the bones in the shoulder. 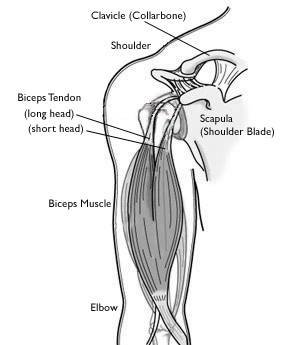 Weakness and pain in the front of the shoulder are common symptoms of biceps tendonitis. They can often be relieved with rest and medication. Surgery is sometimes necessary to repair the tendon. The head of the humerus fits into a socket (called the “Glenoid”) in the shoulder blade. A group of muscles and tendons keeps the shoulder centred in the shoulder socket. These muscles are called the rotator cuff. They cover the head of humerus and attach it to your scapula. The biceps muscle (in front of your upper arm) helps you bend your elbow and rotate your forearm. It also stabilizes the shoulder. The biceps muscle has two tendons that attach it to bones in the shoulder. 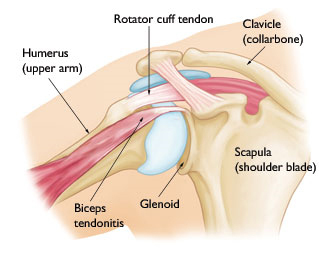 The Glenoid (socket) is lined with soft cartilage structure called the labrum. This tissue helps to stabilize the head of the humerus into the shoulder socket. In the early stages of biceps tendonitis, the tendon becomes red and swollen and as the condition worsens, the tendon often thickens. The biceps tendon in these late stages is often dark red in colour due to the inflammation. The damage to the tendon can result in a tendon tear, and then deformity of the arm (aka a “Popeye” bulge in the upper arm). As we get older, our tendons slowly weaken with everyday wear and tear. This degeneration can be worsened by overuse (repeating the same shoulder motions again and again). Tennis and swimming are some examples of repetitive overhead activities. Many other activities and even routine chores can cause overuse damage as well. Repetitive overhead movement plays a role in other shoulder problems that occur with biceps tendonitis. Rotator cuff tears, osteoarthritis, and chronic shoulder instability are often caused by overuse. Your doctor will perform specific physical examination tests to check the function of your biceps. Ultrasound and Magnetic resonance imaging (MRI): These studies can create better images of the soft tissues around and inside the shoulder. Your orthopaedic surgeon will work carefully to identify any other problems in your shoulder and treat them with your tendonitis. Rest: Try to reduce overhead activities. Ice packs: Apply for 20 minutes at a time, several times a day, to keep swelling down. Do not apply ice directly to the skin. Nonsteroidal anti-inflammatory medicines (Voltaren, Brufen, Cataflam, Coxflam, Arcoxia, Celebrex etc) reduce pain and swelling. Steroid (cortisone) injections: Cortisone is a very effective anti-inflammatory medicine. Injecting steroids next to the tendon can relieve pain. Your doctor will use these cautiously. In rare circumstances, steroid injections can further weaken the already injured tendon, causing it to tear. Physiotherapy: Specific stretching and strengthening exercises will restore range of motion and strength of your shoulder. If your condition does not improve with proper nonsurgical treatment, your doctor may suggest surgery. Surgery may also be necessary if you have other shoulder problems. Surgery for biceps tendonitis is usually performed arthroscopically (key-hole surgery) - your doctor makes small incisions around your shoulder and then inserts a small camera and miniature instruments through the incisions. This allows your doctor to assess and treat the condition of the biceps tendon as well as other structures in the shoulder. 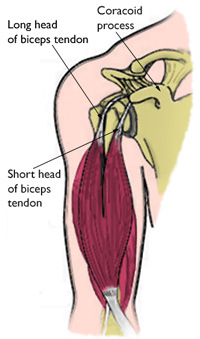 Repair: In many cases, the biceps tendon can be repaired and strengthened where it attaches to the shoulder socket. Biceps tenodesis: The damaged section of the biceps is removed, and the remaining tendon is reattached to the humerus. Removing the painful part of the biceps usually resolves symptoms and restores normal function. Dr van den Berg does this surgery arthroscopically. 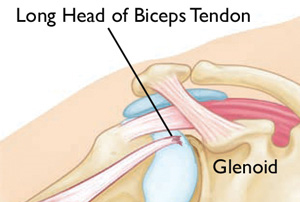 Tenotomy: In severe cases or in older patients, the long head of the biceps tendon may be so damaged that it is not possible to repair or tenodese it. The damaged biceps tendon is released from its attachment. This option is the least invasive, but may sometimes result in a “Popeye” - buldge in the upper arm. Surgical complications: Complications are rare with arthroscopic procedures. Infection, bleeding, stiffness and other problems are much less common than seen in open surgical procedures. Overall, complication rates are low, and complications are usually simple to correct. After surgery, your doctor will prescribe a rehabilitation plan based on the procedures performed. You may wear a sling for a few weeks to protect the tendon repair. Your doctor will soon start you on therapeutic exercises (physiotherapy). Flexibility exercises will improve range of motion in your shoulder. Exercises to strengthen your shoulder will gradually be added to your rehabilitation plan. Surgical outcome: Most patients have good results. They typically regain full range of motion and are able to move their arms without pain. People who play very high-demand overhead sports occasionally need to limit these activities after surgery. If you tear the biceps tendon at the shoulder, you may lose some strength in your arm and be unable to forcefully turn your arm from palm down to palm up (supination). Many people can still function with a biceps tendon tear, and only need simple treatments to relieve symptoms. Some people require surgery to repair the torn tendon. Biceps tendon tears can be either partial or complete. Partial tears: Many tears do not completely sever the tendon. Complete tears: A complete tear will split the tendon into two pieces. In many cases, torn tendons begin by fraying. As the damage progresses, the tendon can completely tear, sometimes with lifting a heavy object. Fortunately, the biceps has two attachments at the shoulder. The short head of the biceps rarely tears and many people can still use their biceps even after a complete tear of the long head. When you tear your biceps tendon, you can also damage other parts of your shoulder (rotator cuff and labrum). Injury: If you fall hard on an outstretched arm or lift something too heavy, you can tear your biceps tendon. Overuse: Many tears are the result of a wearing down and fraying of the tendon that occurs slowly over time. This naturally occurs as we age. It can be worsened by overuse or repetitive movements. Overuse can cause a range of shoulder problems (tendonitis, shoulder impingement, and rotator cuff injuries). Age: Older people have put more years of wear and tear on their tendons than younger people. 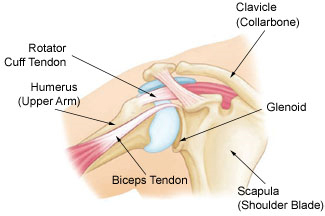 Shoulder overuse: Repetitive overhead sports - such as swimming or tennis - can cause more tendon wear and tear. Heavy overhead activities: Too much load during weightlifting is a prime example of this risk, but many jobs require heavy overhead lifting and put excess wear and tear on the tendons. Corticosteroid medications. Using corticosteroids has been linked to increased muscle and tendon weakness. Smoking. Nicotine use can affect nutrition and blood supply in the tendon. Because a torn tendon can no longer keep the biceps muscle tight, a bulge in the upper arm above the elbow (“Popeye Muscle”) may appear. After discussing your symptoms and medical history, your doctor will examine your shoulder. The diagnosis is often obvious for complete ruptures because of the deformity of the arm muscle (“Popeye Muscle”). A biceps tendon tear is made more obvious by contracting the muscle (“Popeye Muscle”). Partial ruptures are less obvious and to diagnose a partial tear, your doctor may ask you to bend your arm and tighten the biceps muscle. Pain when you use your biceps muscle may mean there is a partial tear. It is also very important that your doctor identify any other shoulder problems when planning your treatment. The biceps can also tear near the elbow, although this is less common. A tear near the elbow will cause a “gap” in the front of the elbow. Your doctor will check your arm for damage to this area. X-rays. Although X-rays cannot show soft tissues like the biceps tendon, they can be useful in ruling out other problems that can cause shoulder and elbow pain. Ultrasound. Good images and cheaper than MRI. Does not show biceps inside the joint. Magnetic resonance imaging (MRI). These scans create better images of soft tissues. They can show both partial and complete tears. Ice. Apply cold packs for 20 minutes at a time, several times a day to keep down swelling. Do not apply ice directly to the skin. Rest. Avoid heavy lifting and overhead activities to relieve pain and limit swelling. Your doctor may recommend using a sling for a brief time. Physical therapy. Flexibility and strengthening exercises will restore movement and strengthen your shoulder. Surgical treatment for a long head of the biceps tendon tear is rarely needed. However, some patients who require complete recovery of strength, such as athletes or manual labourers, may require surgery. Surgery may also be the right option for those with partial tears whose symptoms are not relieved with nonsurgical treatment. Several new procedures have been developed that repair the tendon with minimal incisions. The goal of the surgery is to re-anchor the torn tendon back to the bone. Complications with this surgery are rare. Re-rupture of the repaired tendon is uncommon. After surgery, your shoulder may be immobilized temporarily with a sling. Your doctor will soon refer you to a physiotherapist. Flexibility exercises will improve range of motion in your shoulder. Exercises to strengthen your shoulder will gradually be added to your rehabilitation plan. Be sure to follow your doctor's treatment plan. Although it is a slow process, your commitment to physical therapy is the most important factor in returning to all the activities you enjoy. Surgical Outcome. Successful surgery can correct muscle deformity and return your arm's strength and function to nearly normal.